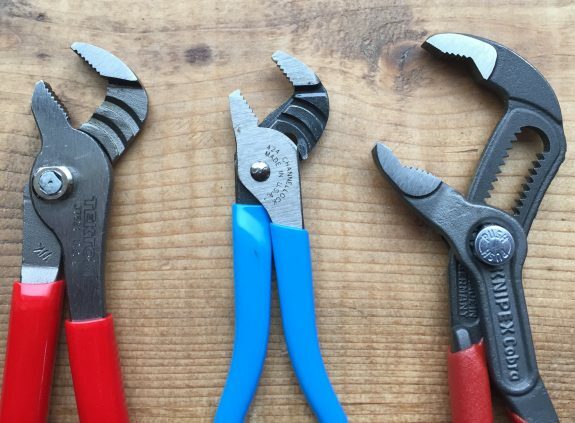 This isn’t really going to be a fair comparison because the Knipex Cobras smoke the other pliers in this list on everything except price but that doesn’t mean the others are useless or junk. In fact, the Tekton 37521 might be one of the best values we have profiled so far. 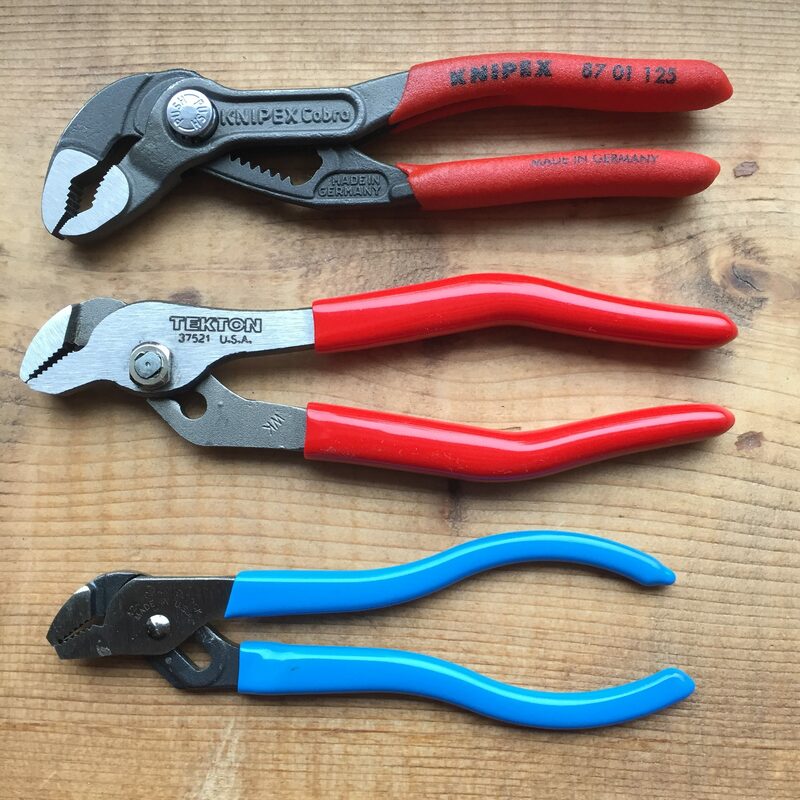 Quality – The Knipex Cobras are plainly the highest quality pliers in the bunch. They are beautifully drop forged, perfectly ground, and have knife-hard jaws that grip tenaciously. Then I think the Tekton Pliers, which are made in the USA, win out over the Channellocks on the strength of the Tekton’s adjustable pivot which make them feel tighter. Features – The Knipex Cobras are feature rich, while the others are straight forward and functional. The Knipex pliers have very hard jaws with teeth that are set opposed to the direction that you turn the pliers which allows them to actually lock into whatever you are trying to turn. They also have a massive adjustment range and large jaws which is key for EDC pliers – something that needs to be small enough to carry but versatile enough (and large enough) to use on a variety of fasteners. The Tektons are only slightly larger than the Channellock 424s but that little but of extra bulk gives you larger jaws, more comfortable grips, and a more functional adjustable pivot. The Tektons take second place on features. Size – The Channellock 424s are the smallest and lightest pliers in this comparison. The Tektons and Knipex Cobras are similar in size with the Tekton pliers being ever so slightly larger in most dimensions. As mentioned above, the Knipex Cobras have the largest jaws by a long shot. All three of them are easily pocketable. Price – This is where the Tekton and Channellock come out ahead of the Knipex Cobras. The Channellock 424 cost around $12-14, the Tekton 37521 are usually $10-12, and the Knipex Cobras come in at a hefty $28-38 (I’ve seen them lower but you’ll have to really shop around). I’ve purchased all three and I believe the Knipex Cobras justify their price. There is just nothing else like them and I am willing to pay for that. However, if you can’t stomach the Knipex price, the Tektons are a smoking deal. How to Choose – If you absolutely need the smallest and lightest pliers for your kit, get the Channellock 424. If you want EDC pliers that can do anything small pliers can do but can be pressed into the work of larger pliers, choose the Knipex. If you want the best value on a capable pair of pliers for your EDC tool kit, the Tektons wins. There are a number of 4.5-5″ adjustable pliers on the market from Irwin and others. Do you have compact adjustable pliers that you prefer? Tell us about it below.